On the 23rd of August 1977, Russian Constructivist sculptor, and pioneer of Kinetic Art, Naum Gabo died in Waterbury, Connecticut. Whilst his real name was Naum Neemia Pevsner, he ended up changing it to avoid confusion with his brother and fellow Constructivist artist Antoine Pevsner. While visiting Pevsner in Paris in 1913–14, Gabo met the artist Alexander Archipenko and others involved with the avant-garde. During World War I he lived with Pevsner in Oslo, Norway. There, Gabo produced his first Cubist-influenced figurative sculptures, exemplified by Constructed Head No. 2 (1916), which he executed in celluloid and metal. The brothers also began to experiment along the Constructivist lines laid down by their fellow Russian Vladimir Tatlin. Constructivist sculpture as practiced by Tatlin had definite political implications, but Gabo was more interested in its use of modern technology and industrial materials. To define the volumes of mass and space more clearly in his sculpture, Gabo used some of the new synthetic plastic materials, such as celluloid, nylon, and Lucite in order to create constructions whose space seem to flow through, as well as around, the transparent materials. 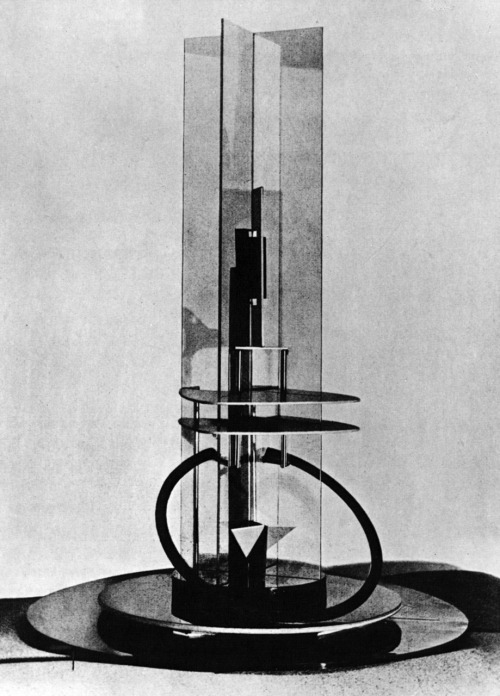 In works such as Column (1923), the sculptor opened up the column’s circular mass so that the viewer can experience the volume of space it occupies. Two transparent planes extend through its diameter, crossing at right angles at the centre of the implied cylindrical column shape. The opaque coloured planes at the base and the inclined open ring set up counter-rhythms to the crossed upright planes. They establish the sense of dynamic kinetic movement Gabo always sought to express as an essential part of reality. “The Constructivists’ rejection of traditional sculptural media was a rejection of historical values: in turning to the utilitarian materials and constructional methods of developing technology, the artists expressed an innovative ideology associated with industrialised urban life and a concept of progress. One way they challenged aesthetic values was to conceive their works in processed materials, which not only lacked appealing textures but, they seemed to believe, would not become weathered and patinated like the sculptures of the past.” (Elizabeth Rankin, A Betrayal of Material: Problems of Conservation in the Constructivist Sculpture of Naum Gabo and Antoine Pevsner; Leonardo, Vl. 21, No. 3, 1988).